west end of north aisle inside the Church. Stone type: medium- /coarse-grained massive yellow sandstone. Front of Cross shaft, south view. The shaft is divided into four panels. The first panel, at the top, has two creatures, possibly birds, which are intertwined. The second panel has three figures facing out, each standing in an identical posture with the right hand bent, arms across their chests and their feet turned to their right. Their heads are framed by joined haloes. The next panel is of eight-strand plain plait. The fourth panel is a Crucifixion scene. The cross is centrally placed. Christ stands upright and facing out with his head turned left. He is wearing a tunic-like garment. Above the arms of the Cross are the sun and moon, the moon is on the left and the sun on the right. 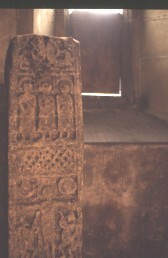 Below the Cross, on either side, are the figures of the sponge-bearer and the cup-bearer. They are both in crouching positions with their legs braced on either side of the shafts they hold.